I presented an education slot a couple of weeks ago, on the power of consistency. I had recently been on holiday with my wife, and had been trying lots of different places in France, searching for a great coffee. 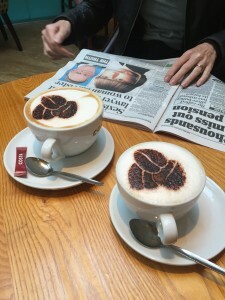 But very few places could do a cup that was up to a standard coffee chain coffee in the UK. There were a lot of places still using UHT milk, and even when we did find a nice cup, it often wasn’t the same when we returned and it was made by someone else. It was a welcome relief to get back to the UK and back to Costa, who served up the usual. And it looked and tasted exactly as it should. Is it the best coffee in the world? No, definitely not. But it is better than all the independent places we tried. And anywhere in the UK, you know what you’re going to get. As long as your expectations aren’t too high, you aren’t going to get an unpleasant surprise. 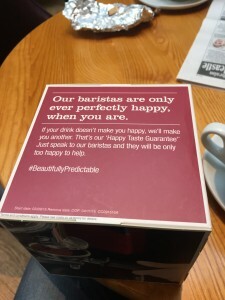 Costa knows this is a major selling point to its customers. They even promote the fact, with their use of the BeautifullyPredictable hash-tag. And consistency is at the heart of many great businesses. The magic of MacDonalds? Ray Kroc built the empire by making sure that the service and the product was the same, wherever you went. What about you? Have you got a product that you deliver consistently, again and again? Or do you sometimes do it this way, sometimes that? Do you have processes, instructions, metrics? Or are you an artisan? Treating each customer as an individual? Well, if you want to build value, you should look to build consistency into what you do, whether you’re providing a service or selling a product. Your customers will appreciate you for it. Author: Jake Liddell. Jake is a marketing consultant, and blogs over at jake.ink.